No. 51396 Cpl. (L./Sjt.) Edward Smith, D.C.M., Lan. Fus. (Maryport). 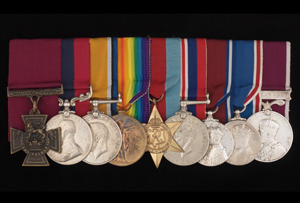 For most conspicuous bravery, leadership and personal example during an attack and in subsequent operations. Sjt. Smith while in command of a platoon personally took a machine-gun post, rushing the garrison with his rifle and bayonet. The enemy on seeing him advance scattered to throw hand grenades at him. Regardless of all danger, and almost without halting in his rush on the post, this N.C.O. shot and killed at least six of the enemy. Later, seeing another platoon requiring assistance, he led his men to them, took command of the situation and captured the objective. During the enemy counter-attack on the following day he led a section forward and restored a portion of the line. His personal bravery, skill and initiative were outstanding, and his conduct throughout exemplified magnificent courage and skill, and was an inspiring example to all. Origin of VC to the Lord Ashcroft collection: Purchased at auction, Spink, London, 1996.